Social media, it’s not just for marketers anymore! I mean, why should we be the only ones who get to take advantage of the billions of people on social media? There’s a wealth of data online that people in sales and recruiting can take advantage of, and I’m here to help you access it. Read on for 5 sourcing tips. The bios are a perfect way to find users who care about the things you’re interested in. 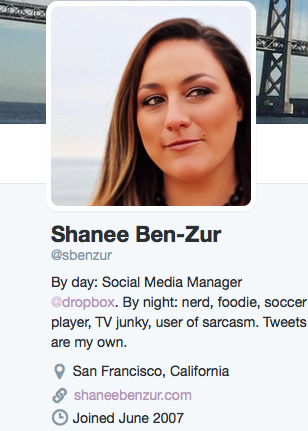 Unfortunately, Twitter’s native search isn’t always the easiest way to mine bios. Instead you’ll likely want to use a third-party tool like Follower Wonk. They offer interesting search options, including # of followers, location, and keyword matches. You may not know it, but Facebook’s search engine is pretty darn sophisticated. As with all networks, you’re limited by what people make publicly available. While many hide their status updates, they tend to be a little more open with their “about” section. Note: While this is a great to find the leads, you may want to consider reaching out to them via LinkedIn or via email rather than on Facebook, if you’re not already connected. Otherwise it could feel a little too aggressive. Even the least social person tends to give social media a try when they’re at a conference or tradeshow, especially Twitter. It’s a great way for people to highlight what they’re learning, to meet others at the event, or even to follow along if they can’t make it to an event in person. For a salesperson or a recruiter, events are like spawning grounds. The salmon are swarming on Twitter! All you need to do is search for the event hashtag and then see real time Tweets come through from potential leads. Try search.twitter.com for simple boolean search on Twitter, or check out their advanced search options. LinkedIn Groups are like virtual professional networking events. While you may not be accepted to join the group, you can sometimes see a list of the group members depending on the group’s privacy setting. This is a great way to find people based on professional affiliations, interests, etc. To search groups hit the icon on the search bar and select ‘Groups’ and then enter the keywords you’re interested in, in the search bar. Yes, Google+ gets a bad wrap sometimes. And some writers have even questioned the future of the network after recent personnel changes at Google. But for now, it’s alive and kicking. So, use the search giant’s social network to do what it’s best at: search. Google+ search lets you tap individual profiles, pages, and communities (much like Facebook and LinkedIn). Similar to my recommendation regarding Facebook, you might not want to use G+ to do outreach, but it’s a great sourcing tool. Hope these 5 sourcing tips help you find the people you’re looking for! If you have any questions or additional tips, feel free to drop them in the comments below.